^ Dams on the Guadiana Basin. Díaz-Pintado Carretón, José (1997). D.L. Soubriet. ed. El polémico Guadiana: historia y leyenda del río Guadiana Alto [The Guadiana Controversy: History and Legend of the Upper Guadiana River]. Ciudad Real, Spain: Argamasilla de Alba. ISBN 84-922069-9-3. Chícharo, Luis; Chícharo, Alexandra; Ben-Hamadou, Radhouane; Morais, Pedro (2007). “The Guadiana Estuary”. In Caroline King. Water and Ecosystems: Managing Water in Diverse Ecosystems to Ensure Human Well-being. Hamilton, Ontario: The United Nations University. pp. 108–117. http://www.inweh.unu.edu/River/Water_Eco_Book/4_SectionII_Casestudies5-8.pdf. Aldaya, Maite M.; Llamas, M. Ramón (2008). “Water Footprint Analysis for the Guadiana River Basin”. Papeles de água Virtual. 3. Madrid, Spain: Fundación Marcelino Botín, Realigraf, S.A.. ISBN 978-84-96655-23-2. http://www.huellahidrica.org/Reports/Aldaya_and_Llamas_2008.pdf. García, Cristóbal García (2003). 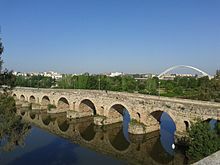 “Results overview for the Guadiana River Basin (Spain)”. WWF Water and Wetland Index – Critical issues in water policy across Europe. Madrid, Spain: WWF (World Wildlife Fund) Spain. http://assets.panda.org/downloads/wwiguadianaspain.pdf. Aldaya, M.M. ; Llamas, M.R. (2009). “Water footprint analysis (hydrologic and economic) of the Guadiana river”. Report to the U.N. World Water Development Report No. 3 to be presented during the 5th World Water Forum. Istanbul, Turkey. pp. 1–77. http://www.rac.es/ficheros/doc/00585.pdf.